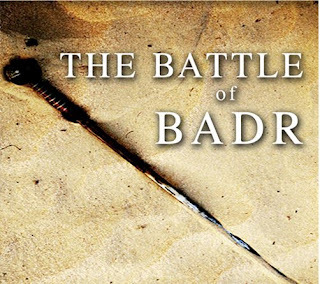 THE COMPANION: The Battle of Badr - The battle of Truth against Falsehood. The Battle of Badr - The battle of Truth against Falsehood. Battle of Truth against Falsehood. The retrieval of their goods, however, was not their only reason for wanting to attack the caravan. The Muslims did not think they should simply remain safely in Madinah; they wanted to spread the message of Islam. They thus felt that if Quraish wanted freedom to trade in safety, then the Muslims must also have freedom to believe in Allah, to follow Rasulullah SAW and spread His Word. It was, therefore, thought that the best and only way to get Quraish to understand this was to attack what was most important to them-a caravan. 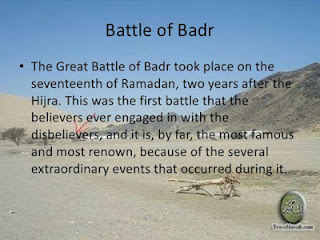 The Battle of Badr has been referred to in the Qur’an as the “Day of Furqan”. Furqan in Arabic means to separate and to distinguish because on that day, Allah SWT clearly distinguished truth from falsehood. On that day, He gave the believers a sound victory and vanquished the hopes and aspirations of the disbelievers who were attempting to bring an end to the growing Islamic Movement. 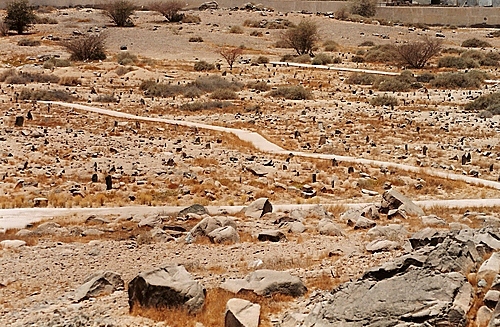 Rasulullah SAW marched from Madinah on a Wednesday evening, 8 days after the beginning of Ramadan, with a small band of men numbering between 313 and 319. From this number, there were roughly 80 to 100 Muhajirun. And the rest of the men were Ansar. 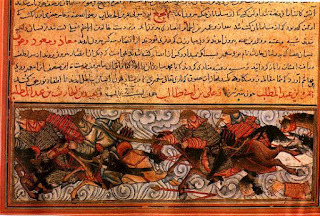 The initial purpose for this expedition was to capture the caravan of Abu Sufian as it was carrying all of the possessions and belongings of the Muhajirun when they had left Makkah for Madinah, to Sham (Syria), where they were now going to be sold by the chiefs of Quraish for a great profit of money. Their intention was one thing, but yet Allah SWT planned for them a much greater event as He alone knows where the good lies for the believers. The Muslims were materially unprepared for any large scale battle and they did not even intend to engage in a battle. As a result, they were first unaware of the war preparations made by the Quraish, who wanted to defend Abu Sufian’s caravan and inflict a heavy blow to the Muslims. 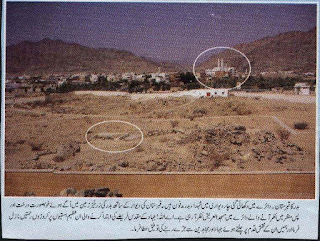 The disbelievers came out of Makkah with 1,000 men, 100 horses, and 700 camels, greatly outnumbering the poorer Muslim army. The Muslims had only 2 horses, but some say that it was actually 3: the horse upon which Az-Zubair sat, Al-Miqdaad’s horse, and the horse upon which Abu Murthad Al-Ghinawi sat. In any case, three horses against one hundred were very disproportionate indeed! 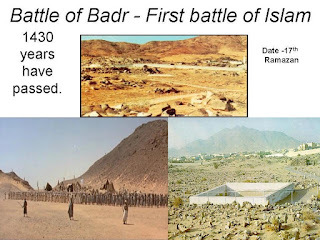 Thus, Abu Jahl refused to return to Makkah without first camping three days at Badr in such a way that all the Arabs would hear about their greatness. On the other hand, at this point, the Muslims had to decide what they should do. 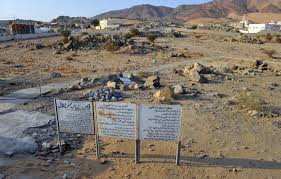 They could have returned to Madinah and avoided any bloodshed but had they done so, they may have looked cowardly in the eyes of the Arab tribes, who were all closely observing the struggle between the Quraish and the new Prophet. They had to make a crucial decision. Allah has promised you one of the two: either the caravan or the army [Surah Al-Anfaal:7]. “We have believed in you and regard you as the true Messenger of Allah, and bear witness that what you have been given is the Truth. And on this we have given you our binding promise, to hear and obey. March on as you desire and we are with you! I swear by Him Who has sent you with the truth, if you ask us to wade through the ocean, we will wade through with you, and not one of us will stay behind! We will be perfectly content with whatever may happen to us tomorrow, at the hands of our enemies for surely, we are patient in war, fierce in battle, and truthful in our company. Perhaps Allah will show you from us what will please you. Therefore, by the grace of Allah SWT , march on with us.” Thus, the stage was set for battle. 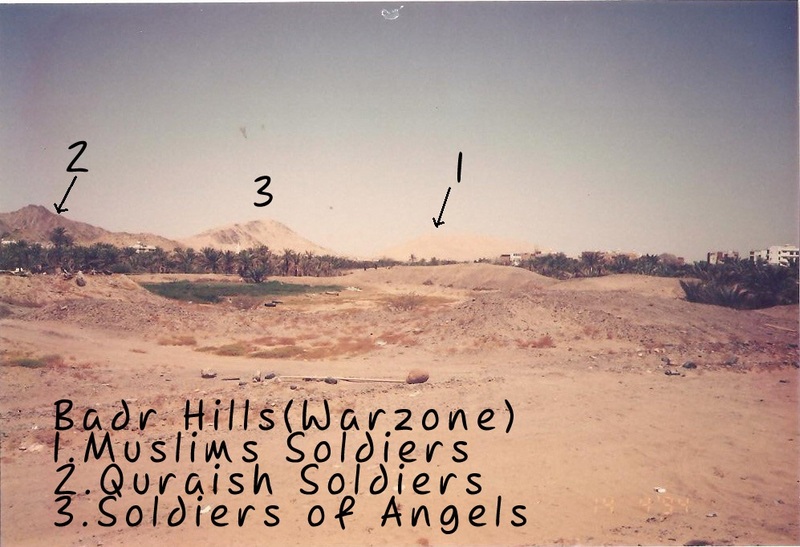 On the night before the battle, Rasulullah SAW made a very long and intense du’a’ to Allah. He was praying under a tree, crying until the sun rose. He was standing up, raising his hands, to the point that the cloth on his shoulder dropped. and strengthen your hearts and make firm (your) fret thereby. 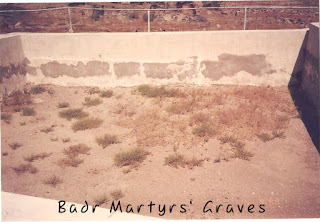 It rained on the eve of Badr. 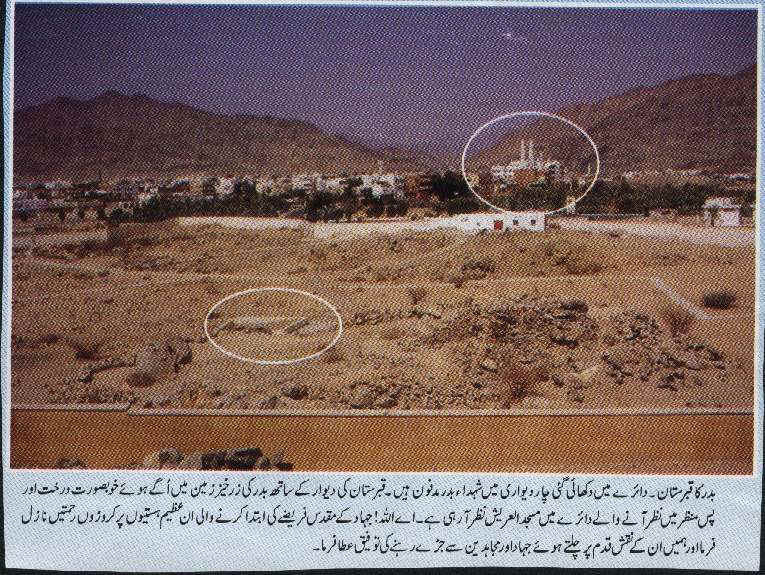 The Quraish who had arrived earlier, had taken over the main wells. The Muslims began to worry about how they would get water, so Allah sent down a heavy rain, allowing the Muslims to drink and use it for purity. And when the rain fell, it also made the sand firm. 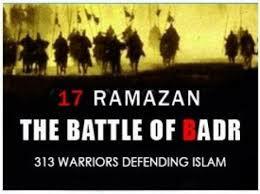 The battle began on Jumu’ah morning and Malik said, “It was the 17th day of Ramadan.” Allah SWT sent down, in support of Rasulullah SAW and the Muslims, 1,000 angels! 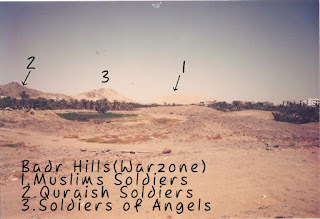 On one side, 500 angels were under the command of Jibril, and on the other, 500 angels were under the command of Mika’il. In this battle, the greatest chiefs of the idolators was slain. Abu Jahl, the Fir’aun of this Ummah, was killed by two youth. 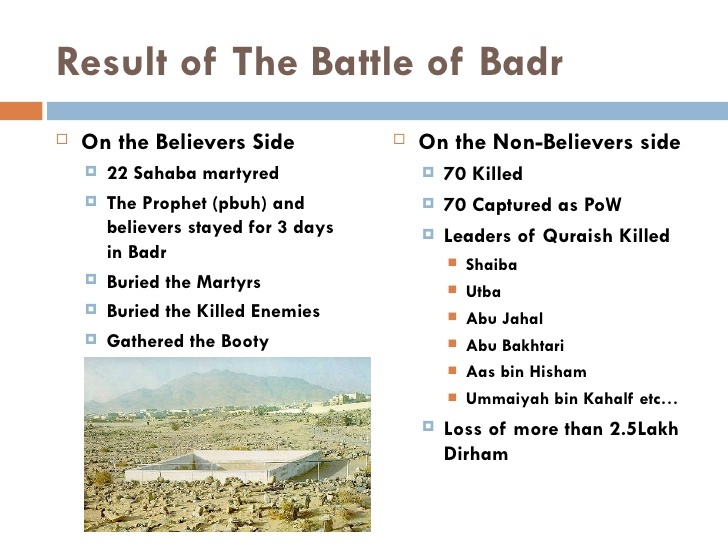 Umayyah Ibn Khalaf, according to some reports, was killed by his previously owned slave, Bilal Ibn Rabah RA, Abu Lahab, who could not attend the battle (but had to stay behind in Makkah due to a disease) soon received the news of Quraish’s defeat at Badr. Abu Suiaan returned and gathered the people in Makkah and told them, “The fact is that we met our enemy and turned our backs. They made us to flee. And I cannot blame our tribesmen because they faced not only them, but also men wearing white robes riding horses, who were between the skies and earth. They spared nothing, and no one ever had a chance.” Later on, a disease spread through the skull of Abu Lahab. It turned to septic, and its poison soon spread rapidly though his entire body, causing many dark pimples (filled with pus) to appear all over his body. He stayed like that for a week before he died. When Abu Lahab finally died, his family and sons, fearing that they might be afflicted with his disease, were hesitant to bury him. So they left his decaying body to decompose in his home for 3 nights. It was only when someone rebuked them strongly and said, “It’s disgraceful; you should be ashamed of yourselves to leave your father to rot in his own house, and not bury him from our sight!” That they decided to do something, but still with great reluctance. 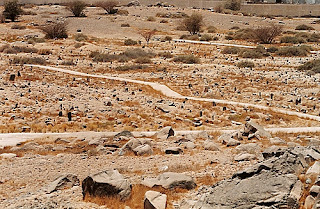 So from a safe distance, Abu Lahab’s sons threw water over his body, and removed his corpse with sticks, and left it by a wall on a high piece of ground outside Makkah, and they threw rocks and stones over it, until it was fully covered. 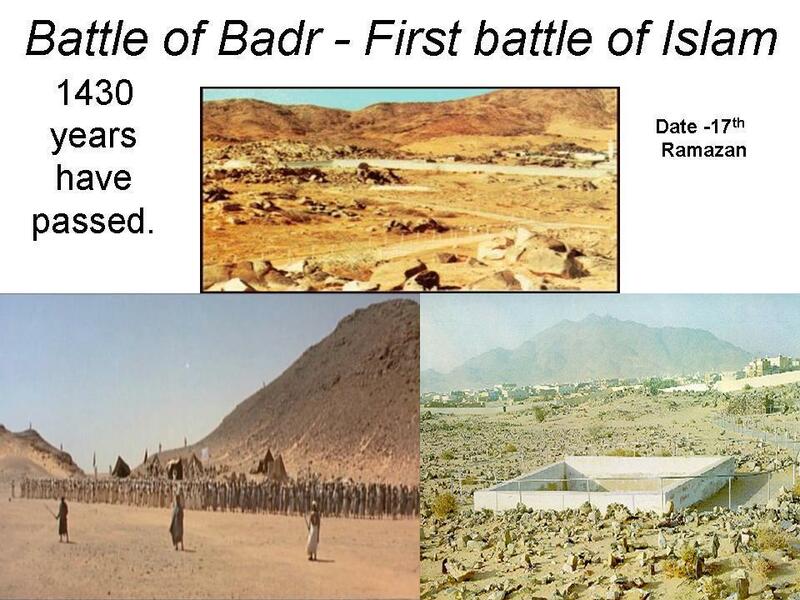 Rasulullah SAW and the Muslims returned from Badr on a Wednesday that was 8 days before the end of Ramadaan. 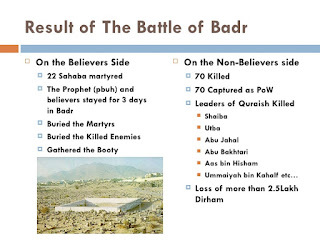 It is noted that there were only a few Shuhada’ from Badr. 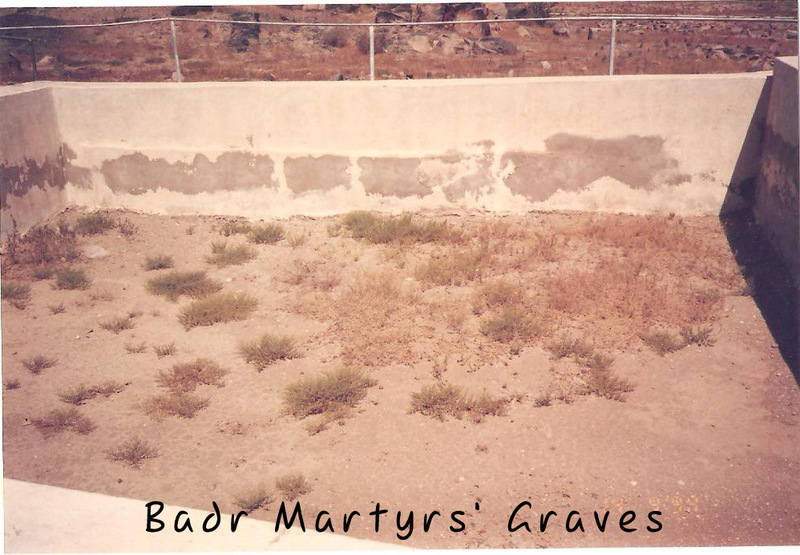 Only about 14 or so Muslims were martyred on that day while many of the idolaters were killed. Regarding the prisoners of the Battle of Badr, this was the first ever battle of the Muslims, and so Rasulullah SAW consulted his Companions over this issue of what to do with these prisoners. 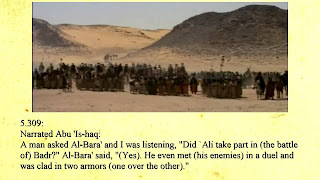 Abu Bakr RA advised Rasulullah SAW to pardon them and accept ransom on their behalf (in order to free them). ‘Umar RA expressed that the disbelievers should be killed, and each one by his own relative (among the Muslims). for the prisoners. There are some reports, that state they gave them the choice, to accept Islam and thus win their freedom, or they could be freed if they taught 10 Muslims how to read and write. This would be their ransom. Al-Haafizh Ibn Katheer mentioned an authentic narration recorded by Abu Dawud in his Sunan, from Ibn ‘Abbas that he said: Rasulullah SAW fixed 400 (Dirhams) in ransom from the disbelievers, in the aftermath of Badr. Whereas the Romans, the Assyrians, and Persians, used to put out their prisoners’ eyes with hot irons and flay them alive, feeding their skins to dogs, such that the prisoners preferred death to life, Islam taught their followers to treat prisoners with mercy and kindness.